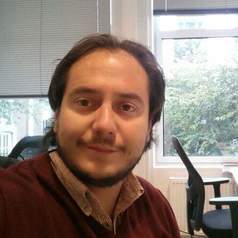 Born in Quito, Andrés obtained his PhD in December 2017 at Maastricht Graduate School of Governance and United Nations University – MERIT, Maastricht University. He is an economist from the Catholic University of Ecuador, and holds a Master Degree in Economics, major in Development Economics, from the Latin American Faculty of Social Science, FLACSO – Ecuador, where he received the Best Thesis Award. He is also Master of Science in Public Policy and Human Development, specialization in Social Policy Financing from Maastricht University, where he received the Top 3% and Best Thesis Awards. Currently he is Assistant Professor on Development economics at the Catholic University of Ecuador. He writes on poverty and inequality, social protection and socio economic development, with occasional excursions into governance and politics. He has more than fifteen years of experience as researcher and consultant. Besides, he had served in international organizations and governmental institutions as Ministerial advisor on social policy, Viceminister of social development, and Minister of planning, and Chief of Cabinet. He is specialized in social policy analysis.